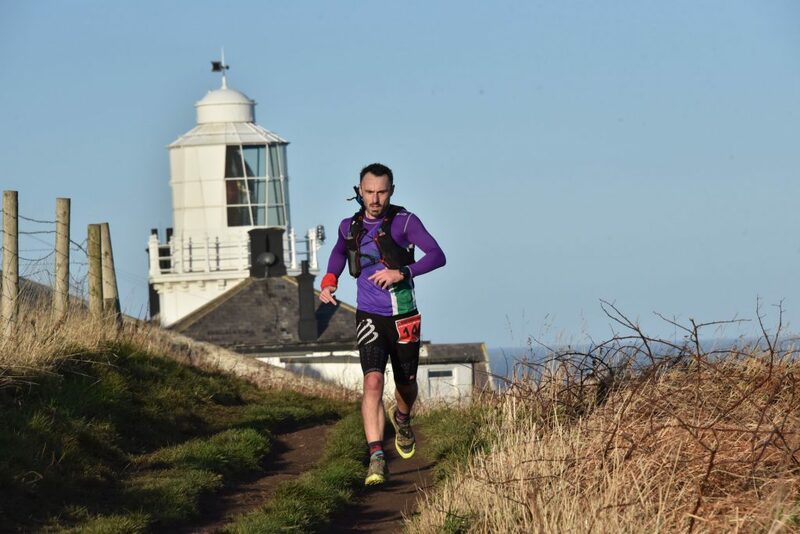 I decided to enter my first Ultramarathon when entries opened for the Hardmoors 30, encouraged by Denise Benvin and Sue Jennings, with the reassurance that Sue would run with me. So, after abstaining from the usual excesses of New Years Eve the alarm woke me up at 530am Friday 1st January 2016 for the journey to Robin Hoods Bay, the weather was promising to be kind to us with a beautiful red hue, hopefully we’d be finished by the time whatever it was warning the shepherds of. Friendly faces filled Fylingdale Village Hall and we were kit checked by Phil Owen and Anna Seeley. All present and correct, tramp stamp obtained, number pick up was as easy as pie, as always with the well organised Hardmoors events. Time enough for a cuppa and peanut butter and banana crepe before race briefing. Jon Steele reminded us of all the usual stuff, be courteous to other people using the routes, no litter, watch out for the missing dog Betty, no swearing at the marshals but sweepers were fair game. Then we were off, down the Cinder track en route to Whitby, so far so good, we could still see other runners in front of us and the sweepers weren’t in sight behind us. Pretty plain sailing so far, very light wind, some surface water on the track, dry feet all the way to Whitby. First real challenge was the 199 steps up to Whitby Abbey – I’d love to know if anyone did actually run all the way up those! Then we hit the Cleveland Way back to Robin Hoods Bay, this is where the fun starts! Mud, mud glorious mud! Slipping, sliding, giggling, squealing, what fun! And Sue even managed to stay upright…… for now……. The 15 ers started going past us, some of them at break neck speed, they were awesome! I couldn’t believe it when we arrived back at Robin Hoods Bay after 13 ish miles, feeling good, happy to see Denise with hot tea, cakes and jelly babies. After a brief stop we were off again. This time from Robin Hoods Bay we were headed to Ravenscar … a slow long drag up to the next checkpoint. Hallway up started feeling grit getting down my socks so a quick stop to re Vaseline the feet (a blister already forming) and change my socks then off we went. Marshmallows and rola cola at the next checkpoint, a nice shout out from Mark Preston and off down the cinder track again headed to Hayburn Wyke the down, the up, the mud, the slippery stones, the little stream at the bottom, beautiful. And still the weather held out. Time to layer up now, we were hitting the later part of the day and it was starting to get a bit chilly, the wind was biting but still not strong. Debating if we should get our headtorches out but decided we had about another hour of light before we needed them, the aim was to get back to the Ravenscar checkpoint before darkness fell. We did it, we got back to Ravenscar and over took 5 people on the way! Feeling pretty pleased with ourselves we embarked on the final leg of the course. In the dark, close to the cliff tops, in the mud. We managed to maintain our lead ensuring we weren’t going to be last. Then it happened, Sue’s spectacular fall. Don’t know quite how it happened but she ended up on her back what seemed like inches away from the cliff edge! Scary stuff. Once we’d ascertained she wasn’t in any real danger and wasn’t hurt we could appreciate the funny side. Just Boggle Hole steps to encounter now quads burning and lungs feeling like they were collapsing we made it to the top. Only a mile or so (and that steep hill from the bottom of Robin Hoods Bay) to conquer. A few young people asked what we were doing “finishing a 30 mile run” we said, “Wow” they said. And we did it, we finished the 30 ish mile route in 8:18 to a huge round of applause. Hot tea and hugs from Phil, Anna and Denise, a welcome bowl of leek and potato soup and the coveted medal and Tshirt. So from couch to ultramarathoner in 3 years- I think that’s something to be proud of! 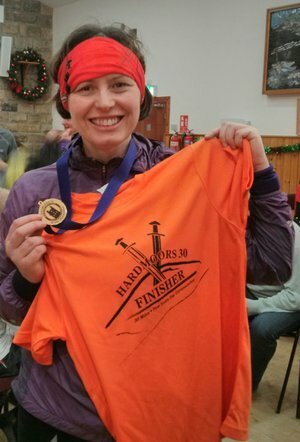 When I got a message from Kerry asking me whether I would run the Hardmoors 30 with her on New Years Day I was well pleased as it meant that I would have company around the route rather than spending the whole day on my own or with the sweepers! We set off from Kerry’s at 7am on New Year’s Day in Beryl (Kerry’s car) and arrived just after 8am and managed to get one of the last parking places. We went in to the village hall at Robin Hoods Bay and registered and then did the usual round of loos, drinks, check backpacks, etc and it seemed to take ages till we eventually set off at 9.30am. It was a fantastic day weather wise – cold but no/little wind, a bit of cloud and no rain – two years ago I ran this race and it was the most horrific conditions – a lot of people said they would never do it again and I remember 2 ladies turning back on the cliff tops after 25 miles saying they couldn’t stand up in the wind! We did the section from Robin Hoods Bay to Whitby along the cinder track (about 6 miles) and then hit the steps going up to the Abbey at Whitby which are always a tough climb – 199 steps in total. The section from Whitby back to Robin Hoods Bay was pretty muddy but no more than we had expected for this time of year – the picture above is from this section. We got back to Robin Hoods Bay (13 miles in) and we were back at the start – could have been quite tempting to stop at this point but that never even entered our heads as we were enjoying ourselves too much. At this point we had been running with a lady with a dog and the sweepers. We left the check point to head up to Ravenscar which is about a 500 feet climb over 4/5 miles on the cinder track – we power walked this section. I had a time in mind that I wanted us to get to Ravenscar in and we missed it by about 3 minutes – at this point the sweepers caught us up and followed us down to Haeburn Wycke – this was a lovely down hill section on cinder track which we ran most of. However what does down must go up as they say. The next section back to Ravenscar was along the coast which was quite muddy and very much back uphill! Fortunately for us, the weather was even more kind to us as the wind had picked up but it was behind us pushing us towards the finish. We had completed about 23 miles by the time we got to this section so were a little tired but we were soon pleased to see that we could see people in front of us. One of the tail runners, Roy, said you will catch them and we did! Before the checkpoint at Ravenscar we passed a 4 people and a dog – just shows the benefits of taking things steady! At Ravenscar we had to switch our head torches on as it was dark but fortunately I knew the route back over the cliff tops to Robin Hoods Bay. We did make a small error and turned down a lane to a farm but quickly realised this was the wrong way and turned back. One of the other runners caught us up at this point and I said to him about passing us if he wanted to. He said he preferred to stay with us, The three of us continued across the cliff tops back to Robins Hoods Bay until I had a fall and hit my head! I wasn’t injured though thankfully and we eventually got back to Robins Hoods Bay and climbed the long, steep hill back up to the village hall. The three of us finished together in a time of 8 hours and 18 minutes. We had a fab day out and thoroughly enjoyed every minute of the race and course. It is a beautiful area of the country to run in and although it was challenging at times, it was well worth it and we would recommend this race to anyone who enjoys off road, longer distance challenges. New Years Day, what a great date to reach my 100th race and my first ultra. The alarm went off at 5am, I’m not a morning person and I was so tempted to stay in bed. 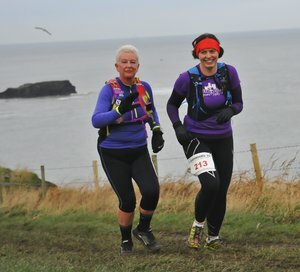 However I had done a lot of races in December just so I could do Hardmoors as my 100th race and that was enough to motivate me to get up. Slow runners were allowed to start with the walkers at 9am which meant were were able to finish in the daylight. 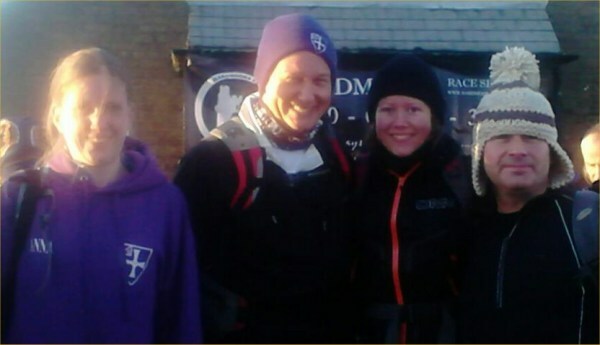 We saw Phil, Anna and Andrew T before we set off (Phil and Andrew T were starting at 10am and Anna doing the 15 mile). The race started by heading south along the Cleveland Way from Ravenscar. We expected the first four miles to Hayburn Wake be muddy but it wasn’t too bad as the ground was still slightly frozen. We then had a steep descent to Hayburn Wake and a climb out of the other side. The four miles back to Ravenscar were along a railway line which I expected to be easy, however it was just one long uphill drag. We then went North to Robin Hood’s bay, this bit was lovely, still on the railway lines but slightly downhill. From Robin Hood’s Bay there must have been a two mile climb along the railway line with no respite, which wasn’t helped by there being a strong wind in our faces, it was energy sapping. Finally the climb stopped and it was a lovely descent into Whitby. At this point we had done 20 miles in 4 hours and only 10 miles left to go :). I was surprised how busy Whitby itself was and we had to dodge and weave around shoppers who were giving us odd looks. I was getting pretty tired now, my ITB was starting to bother me and my shoes were hurting my feet. Once we had climbed all the steps and gone past the abbey we were back on the Cleveland way and the wind was behind us. However it wasn’t easy going as we encountered liquid mud, sticky mud, slippery mud, every type seemed to be there on an undulating route. We tried running these sections but ended up with our feet going more sideways then forwards despite that fact we were wearing mudclaws with big rubber spikes. We went into Robin Hood’s Bay and then had a ridiculous amount of steps to climb back out of the other side, then dropped down into Boggle Hole and more steps out, there was also another section we had to descend and more steps to climb! What with the mud, steps and undulations we ended up having to walk vast sections of the last ten miles it felt very slow going and took us 3 hours! We then arrived at the bottom of Ravenscar. Despite feeling exhausted, my feet hurting and legs heavy, I did not mind the big hill all the way to the top because I knew up there was the finish and that we were going to make it. I strangely remained cheerful throughout the whole thing. Normally once I hit about 20 miles I get a bit miserable and moody. This time I was totally different, maybe I am getting more used to this sort of thing. Once at the top we jogged to the finish which was a huge relief to see. We finished in 7 hours 20 minutes. They supplied us with a much welcomed jacket potato with cheese and some mulled wine. Seems very strange to think I managed 30 miles as it is something I would never have thought possible. ‘Good cross country training’ said one runner after this one. And he was definitely right, it turned out to be a bit of a mudfest. My Kandidas didn’t cope well with that much mud and I was left regretting that I hadn’t used mudclaws. The race started by going south along the Cleveland Way from Ravenscar and that section of about 4m was fine. There was a steep descent to Hayburn Wake and out the other side where the race organiser was waiting at the first checkpoint in a field. As we left the checkpoint we had a view of the field and he was attempting to move his car and he was getting seriously stuck, so three of us went back to help him. As other runners came to the checkpoint, they came and helped as well. It took six of us fifteen minutes to get him out and in that time we all got covered in mud from spinning car wheels. A complete comedy moment, but it did relieve any concerns about the 7 hour cut off being enforced! My expectation was about 6 hours. What I hadn’t realised was that after Hayburn the railway lines climbed back to Ravenscar. That was harder than I had expected. We then went north to Robin Hood’s Bay and that section was fine. Then after Robin Hood’s Bay there must have been a two mile climb along the railway line with no respite. I tried to run sections but most of it was walked. Finally, the climb stopped and the descent into Whitby was lovely. I was still on for about 6hr at this point. Found the Whitby checkpoint and had a cliffbar – these are great, I had some the at the Hardmoors 55m and haven’t seen once since, I must get some. It was fun dodging and weaving round the shoppers in Whitby and there were a few strange looks. Once I had climbed all the steps and gone past the abbey I was back on the Cleveland Way. The wind was behind us and I was expecting to get to Robin Hood’s Bay in 2 hours. It took 3 hours. It was very muddy and much more undulating than I remembered. It was also much longer than I remembered and the headland I needed to get to seemed a long way away. There were also three or four places where I was soaked by seawater even though we were 150 feet above the sea Those places were just a quagmire. About thirty minutes before Robin Hood’s Bay my head torch came out. I had been expecting to run the last hour in the dark (the race didn’t start until 11), but I was still 90 minutes away from the finish when I had to use the torch. This slowed me down even more. Robin Hood’s Bay to Ravenscar is only about 4 to 5 miles but I knew it was tough. The climb out of Robin Hood’s Bay is hard then there are two up and downs before a long climb up to Ravenscar. The runnable parts were very muddy and it was hard to make progress, so little running was done. Finally made it back with an elapsed time of 7 hours 6 minutes, which allowing for the mud shower at checkpoint 1, left me within the cutoff, but only just. I was 28th out of 29 finishers. The last person was over an hour after me. It was a bit of a lonely race, I had not seen anyone after mile 13! This was more than made up for when I entered the Race HQ. There were about 25 people eating and drinking in there and they all stopped what they were doing and gave me an enormous round of applause Ultra runners are lovely and it was just what I needed after a very tough race. Sadly Phil Owen had to pull out after 10m because of problems with his foot. Anna Seeley had a good run and was back in about 6hr 25min. Will had a fantastic run, he was third in a time of round about 4hr 40min !